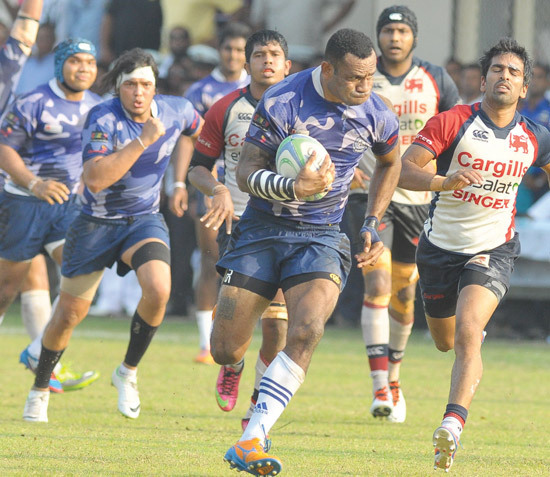 Navy’s Lithu on his way to score a try with Saliya Kumara of Kandy SC making a vain attempt to foil him. Lithu has more support from his team mates skipper Rohitha Rajapaksa and Namal Rajapaksa in their Dialog ‘A’ Division League rugby match played at Welisara yesterday. Pic Susantha Wijegunasekera. Navy Sports Club led by dynamic third row forward Rohitha Rajapaksa enjoyed their finest moment on the rugby field to clinch the Dialog ‘A’ Division League rugby title with a glorious 34 points (four goals, two penalties) to 18 (three tries, one penalty) win over former champions Kandy Sports Club in the decider played at Welisara yesterday after slender 17-13 lead at the breather. Randev Pathirana of Royal College, Colombo and Nimesh Gunasinghe of St.Anthony’s College, Katugasthota maintained the top two positions in the ‘platinum’ category for schools playing in the division one and Trinity’s Raveen Sayer was placed third at the end of count number 3 in then Sunday Observer/Mobitel Most popular Schoolboy Cricketer Of The year contest. The Inter school cricket encounter between Royal and Wesley ended in a draw with Royal taking first innings honours at Campbell Park yesterday. Royal batting first declared their innings at 248 for 9. Geesath Paditharatne (81) Randev Pathirana 43 and Chamika Karunaratne 34 were the main scorers .